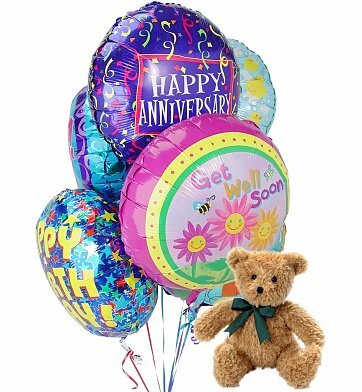 When you send this colorful assortment of freshly filled Mylar balloons and cuddly teddy bear, you are certain to brighten anyone's day. The themed balloon bouquet will be hand-delivered to the recipient's home or office for a special surprise fitting for any joyous occasion. During checkout, please be sure to indicate your preferred occasion when you write your gift card message. Pictured balloon designs and teddy bear may vary per location. A teddy bear, balloons, wine, champagne, or chocolates may be added to your order based on availability. Please contact customer service for more information. Balloons & Bear-6 Mylar is a hand delivered gift. These gifts are delivered by one of our local design centers located throughout the United States and Canada. Same day delivery is available for most gifts when ordered before the cutoff time. The cutoff time for Balloons & Bear-6 Mylar is 2 PM in the recipient's time zone. This gift was chosen for my niece because she was just recently able to be released from ICU and taken to a regular hospital unit at the hospital she is in. Although she is still critical condition and cannot yet eat or speak, this gift was perfect in providing something bright and cheerful for her to be able to look at when no visitors are around. The presentation was very pleasing to the eyes. Did not personally see the balloon group of 6 Get Well wishes and teddy bear as it was sent across country, but am told it was a great hit, especially the teddy bear. found them to be beautiful. I was happy that it was beautiful and delivered on time. The 65th wedding anniversary balloon bouquet and teddy bear sent to the hospital was great. The price was reasonable and delivery to the Medical Center was NEXT DAY without added charges. Would use your Flower Shop again! Great bear & beautiful balloons. I was surprised and vey happy with the bear and the balloons. I was afraid the bear would be scruffy, but it's vey nice and good size. Of course the balloons are beautiful and everything was delivered on time. Will definitely order from you again. Thanks. Just wanted to say thanks to the girls there. It was a pleasure to see there is still real people on the end of a phone that can make your life easier with just some simple, kind, true customer service. I live hundreds of miles away and they made this transaction feel home town easy!!!!!!!!!!!!!! I was very pleased with the services , considering this was my first time . I will recommend this company to anyone. Very happy w/balloons & bear! Yes I would use again... quick delivery!!! I had to call in a couple of times because I couldn't remember spelling of names but it was easy to get back to Melissa and she was so patient explaining the balloon process. I was also having a hard time with what to say on card but between the 2 of us it came out great. She was great: patient, warm, kind and thoughtful! I am impressed by your excellent customer support. I had to contact you twice concerning my order, and you were very helpful. Thank you! I ordered this for my Daughter-in-law and she and the grandbabies were excited about receiving it. The teddy bear was better than expected. Sent this to our son upon his successful return to higher education. There was a problem with delivery since he wasn't home. The company and their driver were in touch with me, several times to arrange a better delivery strategy... it worked and we were very pleased with their patience and kindness. The driver was excellent. Kudos to all who helped with this! My daughter loved the balloons and teddy bear! They arrived on time as promised and they texted her as promised as well to pick up her surprise at her grad school's reception desk. I ordered them the night before and they were delivered by 1pm! A great service that I will definitely use again! Thank you the balloons. It made our sick friend feel so much better. They were beautiful! This was a gift for a little boy who was in the hospital and needed a buddy to help him stay strong. He loved it and it was perfect for this little guy. I got a great service and delivery, will be purchasing again. I'm not one to review stuff like this, but I wanted mostly Gift.com management to know how much I appreciated their customer service. I ordered this on Saturday and they called me three times and emailed me to let me know that they would not deliver on Sunday (I never expected them to). I called them back to say Monday was fine. They could not have been more nice. They won a lifelong customer. I checked "I would recommend this gift", but really I would recommend this company. My recipient checked out of the hospital the night before these balloons were scheduled to be delivered. A customer service rep from the website called me and we re-routed the gift to his home address. They were very friendly and delivered to the new address the same day. I will definately send gifts thru this site again. The balloons and bear made a 3-year old girl very happy. They were delivered when expected and have been long-lasting. I was kept updated every step of the way, from ordering to delivery. I will definitely use this site again. Super Fast delivery! Great service! Thanks for making my best friends bday perfect! I had forgotten to get a gift for my best friend who lived across the country. I ordered the balloons and bear combo assuming they would be delivered in a couple days, no biggie, my friend would eventually forgive me. I ordered from California on my best friends birthday around 11:00am and they were delivered that afternoon in Mississippi right as she got home from work. It was frankly unbelievable seeing as she lives in a very rural area with not much around. The timing could not have been more perfect and it made her day! A salesperson even called me prior to delivery to tell me that I had forgotten to sign a name on the card that was attached. Just another reason why I will definately use this site for all future bday deliveries!! Thanks for saving my day! My grandson received this for his 5th birthday, and had a smile from ear to ear when my son let him open the door to receive it.. I am very pleased with the results! I've always been impressed with the business done ordering from here. Presentations are what has been pictured and have always been delivered on time. Thank you for being a business I can have trust in. My 99 year old Mother loved the arrangment. Very nicely put together. The order came right on time which I appreciate. The balloons that I ordered were very nice, however the bear I ordered looked nothing like the sample bear. My daughter's birthday is a week after Valentine's Day so it was quite obvious she got the left over bears. It was white and red and not very cute at all. But she appreciated the thought behind it. This arrangement was great! My 2 1/2 year old granddaughter had surgery. What child doesn't like balloons! Will be using this site again. bought this for my niece. Product arrived in time, she loved it. Would buy again. I sent the balloon bouquet to my granddaughter in the hospital. The only problem was the optional addition of candy, which was a choice between a box of chocolates or a bag of candy. Her family doesn't like chocolate, so I opted for the bag of candy. Unfortunately, it was a bag of Hershey kisses. I had just assumed, and also from the picture of the wrapped candies, that it would be hard candies. Other than that, it was a great choice, delivered even earlier than expected. This Colorful Mylar balloon arrangement with 2 different Teddy Bears were sent to my twin grandbabies for their 1st Birthday. My daughter sent me photos of the excitement & glee that the twins exhibited. They played with the Teddies but carried the balloons around for 6 weeks (yes they lasted a long time floating)! Finally the balloons floated lower @ their eye level & they had even more fun chasing & batting them around. This gift just kept on giving & providing entertainment for the babies for a very long time! I'll be ordering it again this year for their 2nd Birthday! Thanks for a surprising gift!